At a time when fair trade has been active in France for more than 40 years (Artisans du Monde was created in 1974), a study, commissioned by the ‘Plate-forme pour le commerce équitable’ that groups French fair trade associations to BASIC (Bureau for the Appraisal of Social Impacts for Citizen Information) on the cocoa value chain, illustrates how fair trade contributes to make our food system more sustainable. The study, ‘The Dark Side of Chocolate’ conducts a comparative analysis of social and environmental costs of ‘conventional’, ‘sustainable’ and ‘fair’ cocoa value chains on the basis of the revue of numerous scientific article, documents and interviews. The study starts by recalling that the world market of cocoa is dominated by a few large multinational firms that control 50% of the market, while the production of cocoa is performed by 5 to 6 million producers, the majority of whom live in poverty. As for cocoa processing, it is in the hands of three large multinational companies (Barry Callebaut - 40%, Cargill - 11% and ADM - 8% of the total volume processed). The authors demonstrate that the ‘conventional’ cocoa value chain (operating on the basis of an oligopsonistic and deregulated market) that handles the overwhelming majority of cocoa in the world is unsustainable from the economic, social and environmental perspective. From an economic point of view, the income of producers - in their majority small farmers - is very low and instable despite efforts made by governments in some countries (as in Côte d’Ivoire, the world’s leading cocoa producer), which explains a lack of investment and a decrease in yields. From an environmental point of view, the increase in cocoa production is mainly achieved through deforestation and producers use large quantities of toxic chemical pollutants. From a social point of view, there are an estimated 2 million children working in the cocoa value chain, often in dangerous conditions because of the use of machetes and dangerous chemicals. Estimates of the (hidden) social costs borne by the local society because of this situation are equivalent to more than 3/4 of the total value of exported cocoa! Next to the ‘conventional’ value chain, there has been a development of a value chain certified ‘sustainable’, the certification of which is mainly provided by Rainforest Alliance and UTZ [read], and which, according to the authors of the study report, shows only limited differences with the ‘conventional’ value chain: producer income remains low and instable, even if producers earn a premium of 6 to 7%, and deforestation remains unchanged. So does the use of chemical inputs and child labour. According to the report, hidden social costs of this ‘sustainable’ value chain are however less than those of the ‘conventional’ value chain (-12% in Côte d’Ivoire and -34% in Peru), mainly because of the improvement in producer income. The analysis of the ‘fair trade’ value chain [see fair trade criteria in International trade in agricultural commodities p.11] shows that the condition of producers is improved because of the increase in income they experience and because of a better access to basic services. However, the difference is greater in the case of Peru than Côte d’Ivoire as a considerable part of the premium paid to producers is captured by cooperatives who are very fragile financially. However, in the ‘fair trade’ value chain, producer income is higher and stabler, food security is improved through increased agricultural diversification, health risks and pollution are lower due to a lesser use of chemical inputs, and access to health services and education is made easier through investments made by cooperatives. The report concludes on the importance of producer cooperative dynamics, of the price paid to producers and the premium paid to producer cooperatives in the improvement of producers’ conditions and the reduction of hidden costs of the cocoa value chain. Other improvements could however be brought to the system such as the adoption of agroforestry. 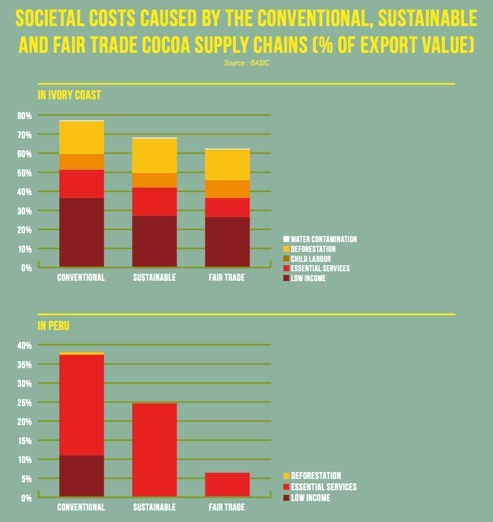 There is one thing that the report does not mention but that is central to the future of the cocoa value chain, is that under current conditions, the ‘conventional’ value chain has a huge competitive advantage because it does not bear the hidden social costs, identified by the study, compared to the ‘sustainable’ or ‘fair trade’ value chains who bear in different ways at least part of these costs, which probably explains why these value chains remain of very limited importance. Indeed, bearing part of the hidden social costs implies a higher consumer price for the ‘sustainable’ and ‘fair trade’ cocoa which can act as a disincentive for consuming them. Hence the extreme importance to explain to the consumer the price difference existing between ‘fair trade’ and ‘conventional’ chocolate. The only way to reduce the competitive handicap of the ‘sustainable’ and ‘fair trade’ value chains, whether for cocoa or for other products, would be to enforce strict social and environmental rules… a beautiful utopia that will certainly require quite some time to concretize! Until this happens, we will have to rely of well informed ethical ‘consumer-actors’ to make the choice to consume better, more sustainable and fairer products. -BASIC, The dark side of chocolate, Summary of the study, Plate-forme pour le Commerce Equitable, 2016.